Disney Songwriter Robert Sherman Has Died : The Record He and his brother wrote "Supercalifragilisticexpialidocious" and "It's a Small World." Composer/lyricist Robert Sherman (left) and his brother Richard stand next to the car used in the 1968 film Chitty Chitty Bang Bang. The brothers wrote the songs for the movie, as well as a musical version that began running in 2002. Robert Sherman — one half of the songwriting team behind Disney movies and major hit musicals — has died. He was 86. The Oscar-winning Sherman Brothers, Robert and Richard, wrote some of the most enduring Disney songs of all time. Their output was astounding: Mary Poppins, The Jungle Book, Chitty Chitty Bang Bang, Bedknobs and Broomsticks, The Aristocats. John Lasseter, of Pixar and Disney, once said, "You cannot forget a Sherman brothers song for your life." Robert and Richard Sherman apparently didn't always get along, but professionally they were in sync. "There was no sibling rivalry when it came to writing," said Robert. In an interview with reporter Jeff Lunden, the brothers talked about the inspiration behind one of their most famous songs. Robert's son had just been given the polio vaccine. "I said, 'Oh, did it hurt?' " Robert remembered. "He said, 'Oh, no — they just put some medicine on a lump of sugar and you eat it. Nothin'.' "
"Next day," said Richard, "he came into the office and he said, 'I think I've got a title.' I said, 'What is it?' 'Spoonful of Sugar Helps the Medicine Go Down.' I said, 'That is the worst thing I have ever heard in my life!' Of course, I snapped out of it right away. I said, 'No, no, no, it's absolutely fantastic, it's great, it's great, let's do that!' "
The Sherman Brothers were self-described Anglophiles, which might explain why their music and lyrics worked so well in stories set in England. They studied classical music when they were young. Their mother was an actress, and their father was a popular songwriter. He once told his sons the rule of the "Three S's": Keep it singable, simple and sincere. Boy, did they listen. 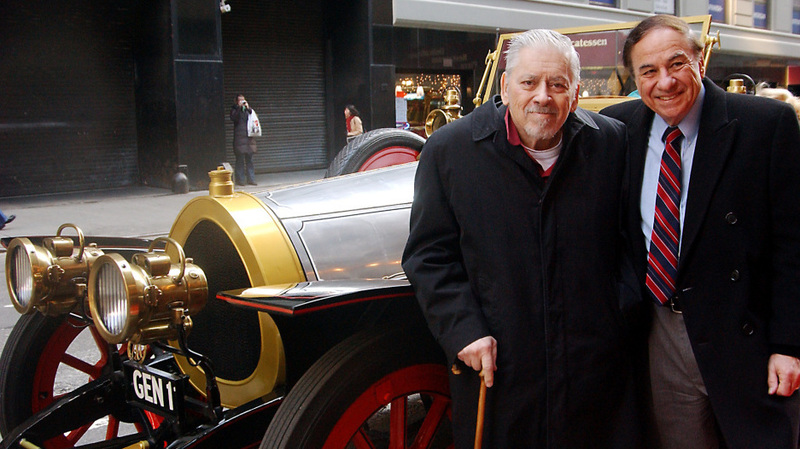 Robert Sherman died in London. He is survived by his younger brother Richard and four children.